Personality↔Kari’s personality mostly depends on what the situation is. When in a new place she tends to keep to herself for a bit, taking in the things around her and the people that happen to be there at the time. After she gets past all of that she’s a fairly social person. That social personality turns serious when she feels that there may be a fight coming. Due to her father she was taught to keep focused and serious when faced with an opponent, never letting her guard down no matter what. One of her bad personality traits is that she doesn't have very good common sense, usually having to have Boverk spell things out for her in real life situations. Fighting styles being the only thing she really understands with no real explaining from others. Bio↔Kari had a fairly normal childhood. Born in the UK she stay with her mother, her father moving back to Japan when her grandfather died leaving his dojo to her father. She lived happily with her mother until her untimely death when Kari was only 6 years old. After which she was sent to live with her father at his dojo in the Ikebukuro district of Tokyo, Japan. She enjoyed watching all of the student (mainly men) that came to train under her father. After two years of just watching, her father’s students were finally able to convince him to train her as well. Kari learned fairly quickly, moving from opponent to opponent. Her father was impressed and going against tradition (usually a man of the family would inherit not a female) had her in line to take over the dojo when he died. Though, that hope was short lived when she started into the lifestyle of street fighting. Before her father died around the time she was 14 the dojo was passed to one of the more skilled teachers of the dojo. His will made it clear that she would not inherit the dojo until the man saw fit to give it to her. Nearly two years had passed after that and once a month she would go to the dojo and challenge the man for her right to inherit the dojo, each time leaving empty handed and even ending up in the hospital on a few of those visits. A few weeks after she had turned 16 she receive a letter in the mail inviting her to an island for advanced fighters all over the world. In the letter it said that she may be able to find a better way of getting her father’s dojo back. With that in her mind she gladly accepted and set off to the island. Once settled in she was given a serum called gene-x meant to awaken a certain gene in her bodily chemistry, the effect causing temporary blindness and the permanent yellowing color of her left eye. The ability she gained from this genetic change was control over her ki energy to manifest weapons as real as the image of it in her mind. She also met her loved one, Boverk Rovan Viper. Upon first meeting she didn’t particularly like the man but she needed some kind of ally if she was to survive in that kind of place. Feelings developed between the two over time and they both were able to make it to two of the seven best fighters on the island. Over her time of being there at Ludus she had faced near death situations, broken limbs, the effects of the other gene-x users on the island, and even attacks from the different creature that inhabited the island as well. Finally after being there for so long she was able to escape with the other seven in her group and disappear under the radar in the outside world with Boverk. Weakness ↔ Without her ki she is pretty much usless, not even having the energy to use basic martial art techniques she learned as a child. Extra↔A large scar on her lower bag, the resulting factor of one of her fights at Ludus almost resulting in paralysis from the waist down. Best suited for weapon users, this style allows a fighter to create weapons from their own Ki as well as infuse energy into other objects to achieve more deadly effects. With the Gene-X applied a fighter is able to take the ki that surrounds their bodies and shape it into weapons they need. With the mental image of a desired object the weapon can be formed, and it will follow every principle the fighter remembers about a real weapon of its nature. However, the ki cannot exist for long after it is separated from the body's circulating energy, and so even ranged adaptations will disappear mere seconds after leaving the fighter's touch. For some reason this style permeanently changes the user's ki color to either green or purple. Everybody starts somewhere, and so this stage is all about forming short range weapons. The fighter still hasn't adapted themselves to further ki manipulation, and so they can't make weapons longer than a couple feet. Training is done in 3 steps. The first is materialization in dreams, where the user has to 'magically' obtain their own weapon within a nightmare to save themselves. Then the second step is meditation. By meditating on the dream the fighter can put themselves back in the mindset where they first obtained their weapon out of supposedly nowhere. This allows their ki to reconstruct their energy flow and simulate reobtaining that weapon. Finally, the third and final stage is Materialization, where the user focuses their ki into the already reconstructed pathways to bring the weapon into existence as a literal extension of the fighter's ki and body. User clenches their fist to form an 8in knife in their hands. Can also be used to form a 1ft dagger for D-rank ki instead. The user focuses their ki into their nails and an outlier of energy extends a few inches beyond each nails to give them something akin to claws, each nail as sharp as a blade. The ki will disappear after 5 posts and have a 2 post cooldown before it can be used again, less the user burn off the tips of their fingers forcing the energy to remain. User clenches their fist to form a 2ft hatchet (they always clutch the handle). This can also be thrown accurately at medium-range targets, though the hatchet will disappear a few seconds later, usually by the begining of the user's next turn. This stage focuses on forming ranged weapons and projectiles out of ki. Training consists of repeating the same training method as the first stage, but only with a ranged weapon this time. Also if the fighter is not familiar with shooting then they need to visit a training zone where they can test ranged weapons and build their accuracy. In the end the user will be able to use longer weapons, but only those that are ranged like the bow. Researchers speculate that this is perhaps a consequence of undertaking the ranged dream. Also while the user can form ranged weapons, their ammo only comes singularly, and is always detached. For this reason it becomes impossible to form automatic or even most semi-automatic guns with the style, as they'd only be able to materialize the gun and a few separated bullets in their hand with which to load it. User clutches their fist to materialize 4 or 5 shuriken in the spaces between their fingers. 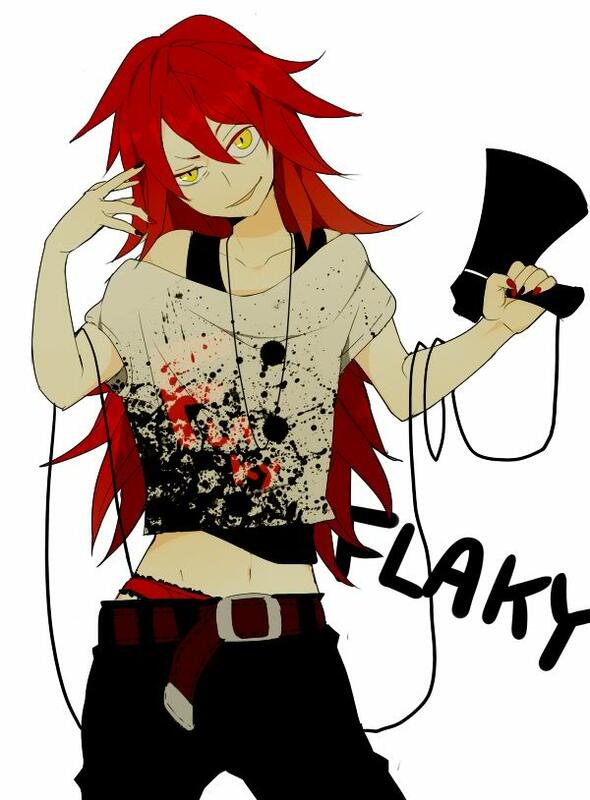 They can then throw these shuriken either seperately or all together to deal slicing damage to medium ranged targets. User touches their hands to grip a bow in one hand and an arrow in the other, usually already properly placed in the string. This allows the user to quickly pull back and fire an arrow accurately at long-range. For C-rank energy, instead of D, the user can form 3 arrows instead of 1 to fire multiple arrows at a time. Extra arrows cost E-rank energy per arrow. User clenches their fist to form a cowbody style revolver in their hand. This is the only useful gun a user can form, since the bullets are easier to individually place inside its cartridge. Six bullets form in the user's other hand, and they must be loaded into the gun before it can fire. E-rank energy per each additional bullet. The user begins forming longer and tougher weapons. They cost more energy, but are more difficult to break. From this stage on the weapons take a rank above their own to break, while ranks of their own or under will but damage them or do nothing. Training is done with long hours of meditation and practice. User clenches their hand to form a sword of ki of their choosing. This could be a katana or broadsword but it cannot be longer than 5ft and no thicker than a few inches. Although it is only C-rank this sword can still cut through B-rank defenses. Keep in mind though that it can still be destroyed by B-rank attacks. The user clenches both hands around an invisible object which their ki then forms into either a staff, a spear, or a halberd. Possibly the longest weapon the fighter can form, this staff weapon can be anywhere from 5-7 ft long depending on the user's height. 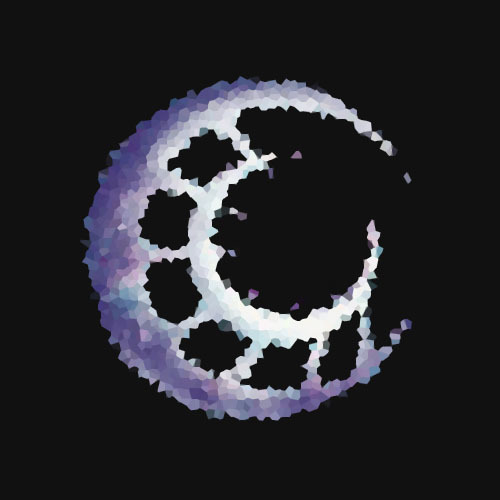 User clenches their fist and throws their forearm around to whichever direction to defend against to materialize a circular shield to defend themselves against oncoming attacks. Can only block against one side at a time. User clenches both fists together, one on top of the other, to form a mighty 5-6ft long and up to 2ft wide greatsword. Like the kinetic sword, the greatsword can slice through defenses up to a rank above its own, making this a very powerful weapon in the fighter's arsenal. However, unless the user is either level 8 or has learned a style that allows them to wield greatswords one-handed, it takes both hands to wield this beast of a sword. Also don't be surprised when people crack jokes that you're overcompensating for something with this technique. It comes with the territory. Now that the user has achieved near mastery of creating their own weapons the style turns to improving real weapons in the fighter's possession by infusing them with the user's ki, more so than what general skills would normally allow. Training is done through practice with real weapons. A user must've mastered at least one stage or skill set of any weapon to learn this stage. Then they have to learn any general skill up to their level that deals with manipulating the weapon through their ki. Finally when those two requirements are met the user will undergo another nightmare while they clutch a real weapon to their bodies as they sleep. This weapon will pass over to their dream self, and with it the user must vanquish the nightmare by combining their ki with said weapon. The user infuses their ki into a held object so that after it is thrown or makes contact with something the ki explodes, effectively harming the opponent while throwing them back from the concussive force. Can also be used with C-rank ki instead to produce a larger and more deadly explosion. The user infuses their ki into an object that is programmed with the sole purpose to be magnetized back to the source of their ki, i.e. the user. This allows for effects such that thrown objects will reverse their propulsion after a certain time or distance and hurl themselves back into the user's possession. The user pushes their ki through the weapon they're holding to increase its length by a couple feet. The extension happens almost instantly so its very effective against an opponent who is trying to just barely dodge out of the attack's range. For C-rank energy instead, a user can almost double the weapon's range. Infused with ki a thrown object will follow with incredible precision whatever target in the area that has the most ki. This makes things tricky, for if the user is the person who has the most ki left in the area then the projectiles will home in on them instead. This technique can also be combined with the Kinetic Explosion skill for deadly effects. The user runs their ki through the entire object that they're holding. At the cost of double the rank of whatever its being attacked with, the object they're holding will not be damaged. This allows for miraculous feats, such as stopping a powerful punch with just a pair of chopsticks. 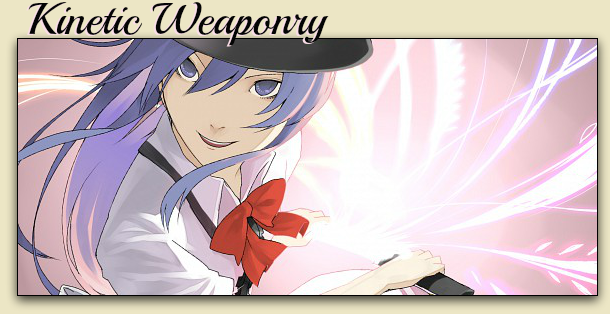 This skill can only be used on real weapons, not kinetic ones. Rather than coating a weapon with their ki, the user coats their entire body with a large quantity of energy. This large amount is then able to literally push themselves into the dreamscape that they always train in, seperating themselves from reality. To the outside viewer their opponent will still be clearly visible, but they will appear faded somewhat, and completely enveloped in pulsing ki. In this state the user can move around, unable to be damaged as they are no longer bound by the rules of reality. However, they will not be able to effect the real world either. Also this skill comes at a very high risk. The user cannot survive inside their dreamscape for more than a few seconds. If they remain in this alternate dimension for anything longer than a single post, then they will be unable to return to reality. Instead they remain forever trapped in their own dream, existing as a sort of ghost to the real world. Can only be used twice per fight. This is where the true power of the style reveals itself. Ultimate mastery of the style is shown through the creation and realization of the user's own ultimate weapon. This ultimate weapon, or "Ultima" as it is dubbed is an S-ranked weapon that is a representation of the fighter. It can be any weapon the user wants it to be, but they have a total of 7ft max to work with. This includes both the length of the weapon and the width, so no weapon of this nature can be beyond 6'11 long. Also this weapon exists always within the user's body as a spiritual part of them. It can be summoned out by clasping a hand to any part of the body and literally pulling it out. None of the user's skills from the previous stages can be applied to this weapon, and if it is destroyed then the user will die as well. However, because it can only be destroyed by the most powerful attacks around, the odds of that happening are extremely unlikely. The whole final stage revolves around forging this weapon, where the user must face all of their past demons in their dreams and reach some form of personal change and enlightenment. While normally the fighter has to touch a part of their own body to summon their Ultima, this skill bypasses the need by using ki to push the weapon out of any spot on the user's body. After grabbing an opponent the user closes their eyes and teleports them inside the Dreamscape, a land created from the user's dreams. The environment could be anything, but the user is subject to whatever rules the area has just as much as their opponent. You cannot kill your opponent with this move. If the user leaves the dreamscape, dies, or is knocked out the opponent will escape back into reality; five post cooldown. Taekwondo is a popular and systematic striking style originating from Korea. In most forms of media today it is most renowned for its strong and lightning quick kicks, though it practices punching as well for when opponents get in too close. Through its speed practitioners can deliver powerful blows at a longer distance, and pummel an opponent into submission before they build up enough momentum to get close. The first stage teaches students the basics of Taekwondo kicks and punch combinations while training develops the flexibility and speed needed to master future stages of the style. The speed aspect of training comes from wearing a very heavy set of weights to their ankles and legs. These weights can be obtained from the storage closet in the Track and Field area of the School. The weights are often so heavy that the user has difficulty even walking around, but they must be worn at all times, even after the first stage has been learned. These weights provide a +1 rank in power, but they also dramatically slow the user's movements and don't allow the student to perform stage 3 or higher Taekwondo techniques. The user can remove these weights if they want to use the Taekwodo (or other kicking) techniques, but otherwise the movement of those skills will be dramatically slowed in exchanged for a bit of added strength. Description: A neat trick the student can use where they can pick up and lift things off of their foot. Description: User shifts to their side and kicks an opponent up under their chin with the outer ridge of their foot to uppercut them into the air. Has a longer reach than the Arcing Uppercut and deals C-rank damage. Description: User throws an axe kick to stun their opponent and bring their head/posture downwards while the user steps forward with a snap-kick to send them flying backwards to the ground. A snap-kick to the head can possibly result in a concussion while a hit to the abdomen will knock the breath out of the opponent. Description: User steps onto the thigh of their opponent's leading leg and kicks them in the back of the head with the heel of their other foot as they step over them. This is a powerful blow so it has a chance of knockout. It also puts the user behind the opponent. Description: User turns their body and launches themselves off the ground at an opponent while thrusting a powerful side-kick into their chest/abdomen. The attack comes so fast that it will often knock the wind out of an opponent while the power knocks them to the ground or breaks bone. The speed of the attack does come at a price though, as the user can only launch themselves straight ahead in one direction. This attack can break the instant-hit effect of Wing Chun's Lunging Punch. Description: Notorious as a study of controlled chaos, the user performs a quick spin to confuse the opponent and build up momentum. 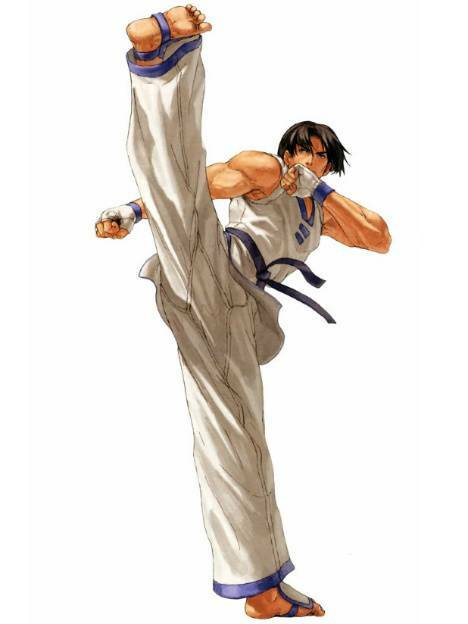 Then one knee is thrust into the air, launching the user's entire body high enough to fire a powerful kick. The momentum generated by your body weight rotating freely, combined with a powerful hip thrust, creates a devastating blow of over 700 pounds of force upon impact, more than enough to break a jaw or even fracture the skull. One of the unique practices that comes from Taekwondo is 'juggling' an opponent with their kicks. This came out of a necessity to constantly have a kick coming at an opponent to control their movements and keep them in a range preferable to the user, but it quickly evolved into a series of quick and creative combos used to set an opponent up for a strike. A user trains for this style by balancing themselves on one foot, with the other always at least hip-high out to the user's side. Within minutes this becomes extremely painful, but after every hour the user is instructed to lift their legs several inches higher than the hour before. All of this is done while still wearing the weights, of course. After a couple days of training a user will either have thighs of steel or they'll be in the clinic, recovering from multiple pulled muscles and tendons. Description: User kicks their leg upward to break an opponent's defense and then axe-kicks (with the same leg) down into the opponent's chest immediately after. This can break through D-rank or lower defenses. Description: User sweeps the opponent's legs with a low kick and then snaps the leg up to deliver a powerful hook-kick to the opponent's temple that will smack them sideways to ground. Description: User sweeps the opponent's legs with a low kick so powerful that it will knock a standing opponent sideways into the air. Then the user smacks the opponent to the ground with an axe-kick of the same leg. Description: The student, from kicking furiously with a single leg in short bursts, has learned how to put that short burst to work upon the enemy. In a blurred fury they quickly kick the enemy wherever they can land the hits. Depending on the student’s level they may be able to carry on more hits. This skill has the same power as Violent Fist, but has a longer reach. Description: The user snap-kicks an opponent under their chin to uppercut their body into the air. While the opponent is still dazed, the user flips over and spikes the opponent to the ground with a quick and powerful kick to the head, giving a very high likelihood for a concussion. This skill can be used in combo after the Vertical Kick for an instant hit. After balance and flexibility have been mastered the student has acquired the ingredients necessary for mastering the air. With overwhelming momentum powered by their Ki the student learns how to take their kicks to the air to deliver stunningly powerful kicks and combos that seem nearly inhuman to pull off. In training the straining weights the student has been made to wear can finally be taken off, as it would be impossible for them to perform such aerodynamic kicks with the weights on. Afterwards the student practices mastering their newly freed strength by combo-ing kicks in the air. They can use other measures of increasing their jump height such as truck tires or trampolines as well until they get the hang of their aerial kick-combos. Description: The student plants one foot in the opponent's chest to stun them. Then the student steps off and flips backwards to uppercut the opponent with their other heel. Description: This is a technique made to hit two opponents who are standing next to or to the side of each other, but can be used on just one opponent as well. The user performs a flying hook-kick to an opponent's temple, but as soon as it connects the user kicks out their other leg to roundhouse kick the other target across their head in mid-air. To a single opponent, if the flying hook-kick is dodged then the roundhouse can still be used to land a surprise hit. Description: User jumps high at the opponent with a wide arcing kick that goes from across their body out to the side. Then while the opponent is busy looking up at the wild arc, the user blasts them with a powerful snap-kick to the chest/gut while still in the air. This trick will usually get opponents who haven't seen it before or are unaccustomed to fighting a Taekwondo user, but even if they manage to block it the force of Ki built up in the snap-kick will push the opponent backwards. Description: This is a technique made to hit two opponents, but can be used on only one if the user spins around their target instead. The user performs a flying kick to an opponent's chest, and after it lands they kick off to spin and roundhouse kick another opponent across their head in mid-air. Description: The user leaps towards the opponent and spins their body sideways several times. Their feet are kept close to each other, blurring together with the instant of speed as they rotate around each other in a vortex of energy until the user kicks the opponent with the built-up momentum. The lower half of the user's body appears so blurred that the opponent is often too dazed or confused about where the attack is coming from to block or dodge it properly. Even if an opponent manages to block this attack, the explosion of force upon impact will blast them away. Now that the student has built up their balance and speed to its fullest bodily potential they begin mastering how to apply Ki to their kicks to dish out unheard of power and abilities. To train for this the student must navigate themselves to a warm sauna or hot spring and meditate. The training is a long but relaxing process. As the warm water loosens their body and relaxes their muscles the user can more easily focus their Ki into their legs and feet. This will make it easier for the student to apply and use Ki to enhance their kicks during a fight. The meditation requires full focus though, so the student will not be able to react to any actions happening around them during their training. Description: The student launches themselves at an opponent in a front flip to deliver an axe kick with each leg. They can both damage the enemy but usually the first kick is used to push down an opponent's defenses while the other delivers the powerful blow, ending with the student landing in a vertical split. Ki is wrapped around the legs to prevent the user from harm during this attack, allowing them to block bladed counters. Description: The practitioner performs a back flip to launch themselves and uppercut their opponent into the air. Then the student comes down upon their opponent, while they're stunned from the uppercut, with an axe kick that blasts them to the ground. Description: The student juggles an opponent with three kicks, but the leg is coated with a sharpened Ki to give the attacks a razor edge that can cut through limbs. This Ki can be spotted radiating from the limb, but it also goes out an additional two inches from the foot, invisible to the human eye, to leave shallow to deep cuts on those who barely dodge the kicks. Description: The user leaps up to their opponent and, in a short bust of fury, stomps down on their head/face repeatedly. The student kicks down so fast that it shakes the opponent's body, similar to Wing Chun barrages, which makes it very difficult for them to counter when the attack hits. Description: By expelling a great amount of Ki the student launches themselves at an opponent, moving so fast that the opponent only sees an after-image of them kicking off before the student is directly in front of them. Then the student rapidly punches/kicks the opponent, and moves behind them to punch/kick them back so fast that there appears to be two blurred users attacking them from the front of and behind the opponent. Any forward counters launched at the user during this epic barrage of strikes only appears to go through them as the user quickly moves either in front of or behind the opponent in time to dodge. After a short fury of strikes the opponent's body is too bruised and battered to defend itself as the user jumps above them and delivers a powerful axe kick to their head for a final strike that deals the A-rank damage. The barrage of strikes only deals B-rank damage. Because of the large amount of energy needed to pull off this attack it has an S-rank Ki cost and can only be attempted twice in a fight. This stage requires that the student already have learned the Trained Eye before attempting, for they train their body to accelerate at such high bursts of speed that the normal eye would hardly be able to glimpse some of their movements. Hence it becomes very difficult for the student to control their own movements without having adapted their vision. This stage utilizes all training methods before it to strengthen the legs and burst large amounts of Ki through them to quicken their attacks and push their movements. Description: The user seemingly disappears and appears above the target suddenly. You may use this to your advantage. 5 post cool down. Can only be used twice in a fight if the opponent knows the Trained Eye technique. Description: The student extends their foot out to the ground, as far away from their body as possible, and spins in a circle. They channel Ki into their foot to engrave a circle into practically any kind of ground, symbolizing the distance of their strike zone. Then, so long as the user does not move away, if anything tries to penetrate the circle the user can activate the Ki they left when engraving the circle that blasts out like a shockwave. This shockwave has C-rank strength, and can reflect normal C-rank or under projectiles. This 'force-field', as it could be called, covers all sides of the user. If the user moves then they lose focus on activating the trace amounts of Ki within their circle and the skill becomes useless. The student cannot use any other skills while standing in the circle. The circle lasts 3 posts, but can only be used once before it loses its power. This skill has a 6 post cool down after the shockwave is used. Description: A very quick technique where, but one that requires a post of charging during which no other taekwondo skills can be used. During this post the user's ki glows three different shades of colors and it becomes more visible than usual as they prepare to unleash this high-level attack, which must be used on the following post or be canceled entirely. Then in a split second the student strikes and his image seemingly splits into three, one throwing a jumping round kick behind the opponent's head with the other two throwing different kicks to the front/side of the head. This effectively seals the opponent within a triangle of attacks that seem to all hit at the same time, making it nearly impossible to dodge because of its speed and unpredictability. If it lands successfully the opponent will suffer an instant concussion while still standing, and often times three rips will be made along their shirt correlating with power of the strikes. Capoeira is an artful style that uses strange, unpredictable moves to outmaneuver and destroy an opponent. Its primary focus is on kicks, to which the style uses handstands and full body swings to bring out its full power. The first stage deals with learning the basics of capoeira. This will first include mastering the fighting stance, which is always kept low to avoid a larger strike zone. They alternate sweeping their legs behind their body while lightly hopping on the balls of their feet to get into a certain rhythm, as well as keep their arms forward and spread out. Since the arms are not used for striking in this style, they instead are used to balance the fighter's constantly shifting body, as well as attempt to keep the opponent's eyes concentrated on their more noticeable arms than their feet. Training wise a capoeira student will go through a lot of cardio-exercises and running, as this style's powerful movements tend to be quite exhausting for beginners. They will also learn how to properly deliver the basic kicks such as front kick, charging side kick, hook kick, and crescent kicks. Description: A fast maneuvering technique where the fighter keeps low to the ground and sweeps side to side and rushes towards a target by moving at constantly shifting 45 degree angle turns. Excellent for dodging projectile attacks while closing the distance to an opponent. Description: A speedy combination where the figher uses a barrage of three sweeping continuous crescent kicks to batter an opponent's head and upper body. Even a single kick has the power to push an opponent's body at least a few inches off of the ground to leave the opponent helpless against the next attack. Sharp claws or toenails on the foot will also give these kicks a cutting edge, and could potentially slice open an opponent's face and throat if hit. Description: The most advanced and powerful of the fighter's single-striking kicks, in this technique the user bends low to the ground and spins while they swing their back leg up at an opponent's head. The blow will land primarily with the hardest part of the human foot, the heel, as well as the underside of the foot. A direct blow will knock out weaker opponents, and at least stun, disarm, or knock over anybody else. The incredible range and power of this kick make it the sniper rifle of all Capoeira techniques. Description: From a low position the user kicks low to the opponent's knees and shins. After the kick though they plant their foot and swing the other around, repeating the motion 3 times to crawl towards and kick the opponent at the same time so its difficult for them to dodge or block. This stage is where the styles strength truly plays out, the ground. From a crouching position on the ground a Capoiera fighter is just as deadly as he was standing up, if not more so. Further cardio, flexibility, and abdominal exercises are used here for training, as they will help with generate fast kicks and recoveries. Description: Through low sweeping crawls and fast maneuvering the user finds an opening in an opponent's legs and quickly shifts through it. The movement may not be much, but it is fast and it puts the user at point blank range to the opponent's backside, leaving their opponent open to attack. Description: Using a movement similar to the Phase Shift technique, the user uses low and fast crawls and sweeps to find an opening in the opponent's legs. Instead of moving through this opening, however, the user grabs the opponent's legs and with a sharp tug sends them to the ground. Doesn't damage opponent but being on the ground they will have a much harder time defending against attacks, especially from the capoeira style. Description: From a low position to the ground the user strikes out with both legs to grab and trip an opponent's legs, bringing them to ground fast. The technique can also be used to hold an opponent's legs while the user strikes or breaks them, but their original purpose is bring their opponent down to their level. Description: A ground attack where the user points their legs up and wide apart in V-shape, and then with their hands pushing them off of the ground they swing their legs around their body multiple times. This is effective for striking downed opponents, and keeping them on the ground. It is also useful for disarming and striking multiple opponents with melee weapons, as one leg kicks the weapon out of their hands while the other strikes at their body. Description: From an on the ground position the user kicks off with their hands and points their feet out at an opponent to dropkick them in the gut, potenially breaking several ribs. This can be used to avoid a low strike while attacking an opponent as well. Whether this hits or misses, the user returns to their standing position. Description: User grabs the opponent's shoulders and then performs a handstand above them. Then they allow themselves to fall over before suddenly turning in the air and kicking the opponent to the side of their head from behind. If this is blocked, then the user can kick them again with their other leg, blasting them away and breaking whatever limb they used to block. This move is particularly effective when the opponent tries to block a user's Rocket Recovery, as it allows the user to easily link this attack by getting easy access to their opponent's shoulders. Next fighters will learn the handstands of Capoeira, which they are so recognized for. Training is very diverse but important in this stage. A strong abdomen is needed, as well as a firm grip of upper body strength and balance to hold and move the body. Trees are often used to help with this part of training, as they can use the tall bark to slowly lean against during handstands to balance themselves, as well as perform hundreds of situps as they hang down from the tree branches. Description: A fast escaping or shifting movement used by performing a low head-stand cartwheel. It is perfect for escaping a strike to the head, or to try and catch an opponent off-balance. Description: In this attack the user swings down into a one-armed hand stand and swings their foot with their body to strike at an opponent's face. It is a simple single-strike attack, but because the movement is so fast and unpredictable victims often say that it was as if the fighter's face had instantly become replaced with their foot. Description: From a two armed hand-stand the user twirls their body around 360 degrees several times with their legs extended. The raw power from this attack will blast anybody within radius several feet back and though it alone is not a kill shot it can deal tremendous damage to multiple opponents at the same time. Description: This is a deadly charging takedown move where the user flips forward onto a handstand and then wraps and locks his legs around an opponent's head. Once landed there is little the opponent can do as the user swings his body around theirs, coiling around it like a snake, and then uses tremendous power to spin and throw an oppoent's head down into the ground where it will skid for several feet. Unless they have some kind of special defense to protect themselves, this attack will instantly break an opponent's neck. Description: After using Phase Shift to get behind an opponent the user shoots their legs up around the arms of their opponent and pulls them to the ground while sitting up. This will make the opponent land in a strong submission hole where the user's legs are pinning the opponent's arms to the ground and the user is sitting up inbetween their legs, unable to be kicked by the opponent. From here the user is free to attack the enemy with their arms while they are helplessly pinned to the ground. Only an opponent of great strength superior to the user can push themselves out of this hold (2 levels higher). After mastering the ground, Capoeira will finally complete its unpredictability and power by mastering the air. Training is done through various extreme stretching exercises to increase flexibility, as well as performing techniques in foot deep water to build leg strength to reach heights for the jumping techniques. By being able to strike from the ground to the air, the user becomes even harder to predict. Description: A quick close quarters move where the user strikes to knee their their opponent in the stomach and then continue to kick an opponent's face with the same leg and send them into the air. This kick is able to retain its strong hits without recoiling by transfering the user's upper body weight down into their leg after the knee strike. Because they have to lean so far back to transfer this power, the user will usually softly land with their back on the ground after the second hit. This is also useful for surprising opponents, as they will not be expecting the second kick so soon and even if they dodge the knee they most likely will collide with the secondary kick. Description: From a standing position the user performs a no handstand backflip (frontflip if opponent is behind) and attempts to uppercut their opponent with both legs. Is particularly an excellent counter for a close-range upper torso strike as it allows the user to quickly dodge under the attack while striking out with the legs at the same time. Speed is on par with the Flash Kick, giving the technique its name. Description: The unpredictability of the style shows itself exceeding well in this move, most effectively used against an opponent attacking from behind, where the user first strikes backward with their leg to uppercut an opponent in the groin, only to follow up in the same instance with a powerful kick upward to the chin of the opponent by the other foot (the user keeps their grounding with a handstand). This launches the opponent up to fifteen feet in the air, and if male the pain is usually so great and sudden that it causes the opponent to black out (if male and of lower rank than the user) until they crash back into the ground headfirst a moment later where they suffer another 3 posts of dizziness as a result. Description: From a standing position the user generates energy in their legs and kicks off of both legs. Then they bring them together in the air, and drop them down on an opponent with immense force. The power alone is enough to crush in heads, break defenses, break collar bones, or get through just about anything in the user's way. Absolute perfection of the style is attained through this last stage. Final techniques require intense knowledge and practice of all previous lessons taught to the user. Most of the techniques seem to defy physics of the human body, truly living up to the style's legendary unpredictability. Beware though, as most of them are very difficult to control and strain the user's muscles beyond what would normally be allowed. Description: User performs a flashy no handstand backflip (similar to the flash uppercut) that attempts to uppercut an opponent with both legs. Even if this misses though, the user kicks their legs out again as they fall back down to kick in their opponent's shins, putting them through immense pain while also bringing them to their ground. This can also be linked with Flash Uppercut, should the skill miss. Description: This is a hypnotic technique where the fighter uses his capoeira movements to put his opponent in a trance. No attacks can be used in the same post as this technique is used, but on the next post the opponent will lose themselves in a dazed state with the user's moves, allowing the user to easily land a direct blow with another capoeira technique. It must be a capoeira move to ensure a direct hit, as breaking the style to use any other moves will likewise break the opponent's trance. Any interuption in the user's movements while this technique is being used will also break the opponent out of the trance. Description: In a handstand position the user rushes forward on their hands and pounds their opponent with a long series of overhead kicks, each of which can easily break through metal, even steel if given the chance. Once one kick connects it is difficult for an opponent to break away from the flow as the kicks appear to be striking at a speed on par with a machine gun. Description: The user surprises the opponent by attacking the opponent first with a vertical hand strike, followed by another behind it. Then the user somersaults forward repeatedly, constantly hitting them with one leg at a time before coming back around to hit them with the arms again. A user can spin forward up to as many times as they'd like, and like the Heavy Rain skill once a strike is made it is almost impossible to get out. This is because the user keeps their stance open, with a limb extended toward both up, down, and sides of the body, so that when they start somersaulting the strikes flow together one after the other is such a fast pace that the opponent simply cannot recover fast enough to block or dodge the next strike. With the strikes aimed generally towards smashing the top of their head downwards, the opponent can't even pull their head up again to see the next strike coming. Though this attack does not cause the more powerful blunt strikes of Heavy Rain, if their nails are sharp enough a user could potentially slice an opponent to ribbons before they can get out. If a user keeps up their spinning for over three posts then they'll suffer two posts of dizziness once finished. Description: User charges their legs with ki and then spins around on their head (or handstand). With their legs kicked out the ki built up creates an instant tornado around the user. Everything in the area will be drawn towards the tornado and once close enough they will lift off of the ground and become part of the tornado. Opponents trapped inside will be spun around up to the top of the tornado, being battered by everything else that is drawn into the tornado as well. Once the opponent is shot out of the top of the tornado they continue to spin uncontrolably until crashing headfirst into the ground, dealing massive damage. Can also be performed in mid-air, and the tornado can absorb up to two C-ranked attacks (or one B-rank). Tornado lasts up to a post after the user stops spinning their legs. 3 post cooldown. 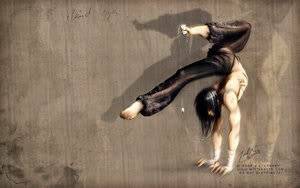 Description: Most powerful single-strike attack in Capoeira. It is something similar to a drop-kick, where the user suddenly rushes an opponent at blurring speed and then jumps into the air feet first to their target with both legs bent in towards the torso. Then the user strikes out with one leg, converting all of the power in both of the opponent's legs and body into a single point on the striking foot, giving it tremendous strength.